Python is a popular general purpose programming language with powerful numerical and scientific packages, numpy and scipy. The Python ecosystem also has a impressive plotting package, matplotlib. The language and packages (the Python ecosystem) creates an ideal computing platform for Science and Engineering analysis and design. But the current distributions does not include a zplane function which many DSP'ers might use because it is availabe in other packages Matlab, Octave, etc. Below is a function to implement similar behavior to the common used zplane function. 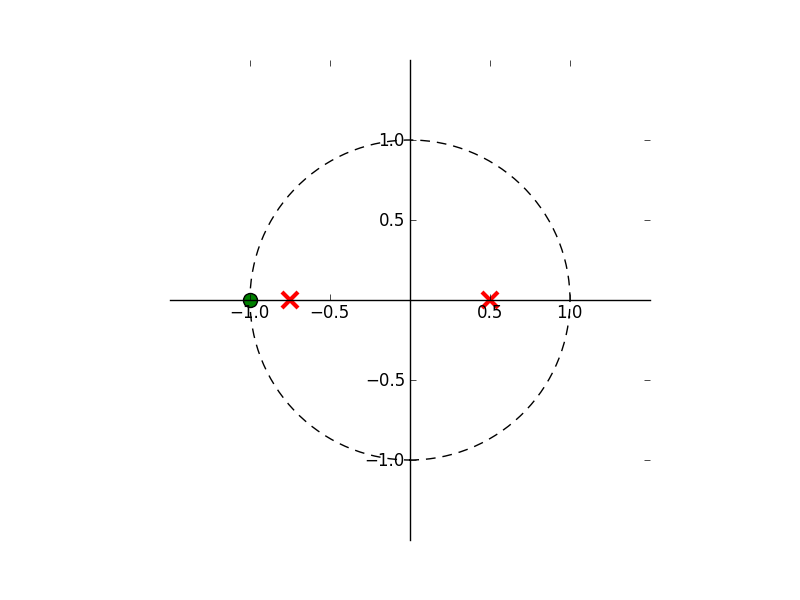 The zplane function takes the numerator and denominator polynomial representation of a transfer function and plots the complex z-plane poles and zeros. For those unfamiliar with a numerical computing package, polynomials are usually represented least order coefficient to the highest order coefficient. An array assignment might look like the following, where *N* is the polynomial order. The function below will plot a complex zplane given an array of b and a coefficients, numerator and denominator respectively. # Alexander Kain for CS506/606 "Special Topics: Speech Signal Processing"
# CSLU / OHSU, Spring Term 2011. """Plot the complex z-plane given a transfer function. Works fine, thank you! I created a little longer example showing also the impulse response and frequency response of the system. For more details see: http://scipy-central.org/item/52/1/zplane-function I hope your code finds its way to the official scipy.signal distribution. Thanks for the additional examples! I don't know if a function like this would be added to the scipy package. Functions that rely on plotting are hard to fit into packages like scipy. A more appropriate spot might be the matplotlib.mlab package. Which isn't a perfect fit either since the z-plane and s-plane are specific to signal processing.